The new bike route signs provide distance information to key destinations. District of Columbia Department of Transportation (DDOT) contractors have installed more than 750 bike route sign plates at 255 locations to mark the new routes on the east side of the District. The five routes total more than 20 miles in length and provide on-street linkages between the Metropolitan Branch Trail, the Marvin Gaye Trail, the Oxon Run Trail, the Anacostia River Trail System and the Anacostia Tributaries Trail System in Prince George's County, Md. The routes use a newly designed bike route sign and provide distance information to key destinations. DDOT selected this set of routes to address requests for more bicycle facilities in Wards 7 and 8; to provide clear access to DC's emerging city-wide trail system; to improve access from East of the River to downtown jobs and resources; and to update old signed routes dating back to the 1970's. For example, in Southwest and Near Southeast, the re-establishment of 4th Street between I and M Streets (Waterfront Metro) eliminated the need for signs directing bicyclists on a convoluted route through the neighborhood. The new route (4.7 miles) links the Pennsylvania Avenue cycletrack to Nationals Park and Historic Anacostia using the Frederick Douglass Bridge. 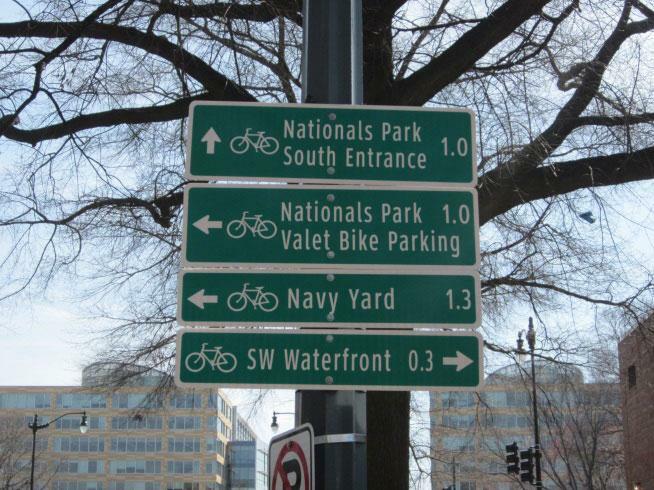 Special directions are provided to the valet bike parking location at Nationals Park and the signs clarify the access point to the new East Bank Anacostia Trail at Poplar Point. 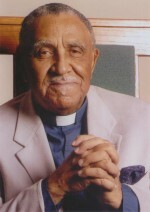 On the east side of the river the route begins/ends in Historic Anacostia at Good Hope Road and Martin Luther King, Jr. Avenue. The Marvin Gaye Trail to Metropolitan Branch Trail (MBT) route (5.2 miles) links Woodson High School and neighborhoods along the Watts Branch to the Minnesota Avenue Metro Station. The route then continues west using a narrow sidewalk along the Benning Road bridge, one of the few bicycle-pedestrian crossings of DC Route 295 and the CSX Benning Yards. It passes through River Terrace and Kingman Park, links to the East and West Bank Trails along the Anacostia River and traverses the northeast neighborhoods on Capitol Hill. It uses bike lanes on C and D Streets, NE to reach Union Station where cyclists may choose to take the E Street bike lane to the heart of the city or the MBT to NOMA, Eckington or Brookland. Also located east of the River, the Heights Bike Route (6.5 miles) links the Marvin Gaye Trail in Ward 7 with the Oxon Run Trail in Ward 8. The neighborhoods of Lincoln Heights, Marshall Heights, Benning Heights, Hillcrest, Garfield Heights and Congress Heights are all linked using Southern and Alabama Avenues, the only through route fully linking the two wards along the southeast edge of the City. A route along Naylor Road (1.5 miles) links the Heights Bike Route to the East Bank Anacostia River Trail and Anacostia Park at Nicholson Street (near the Sousa Bridge). Signs guide cyclists to the bicycle/pedestrian access across the bridge on the down-river side, which is the best route for continuing on to Capitol Hill or Downtown. An on-street connection between the MBT in Brookland and the Northwest Branch Trail near Mt. Rainier, Maryland is a brand new route (2.3 miles), designed to serve as an interim on-street route for the East Coast Greenway (ECG). Until the MBT trail system is completed along the Fort Circle and between Catholic University and Ft. Totten, this route will guide local cyclists around the base of Bunker Hill (better than going over the top). It will also welcome Maine to Florida cyclists who are following the East Coast Greenway, a city-to-city version of the Appalachian Trail. Combined with ECG signs installed along the National Mall in 2008, this will complete signing of the ECG route through the District of Columbia. To meet the goals set forth in the 2005 Bicycle Master Plan, the District hopes to create 10 miles of new bike routes every year through 2015. For more information about DDOT's Bicycle Program, go to ddot.dc.gov/bikes.